It happens without fail. Every time I buy eggplant to use in a recipe at home I question why I don’t buy it more often! Though eggplant has only been on my vegetable radar for a few years now, it’s one of my favorites (especially in the form of baba ganoush, which I must make at home sometime soon!). I have several eggplant recipes pulled from magazines and I’m committed to finally making them this summer! 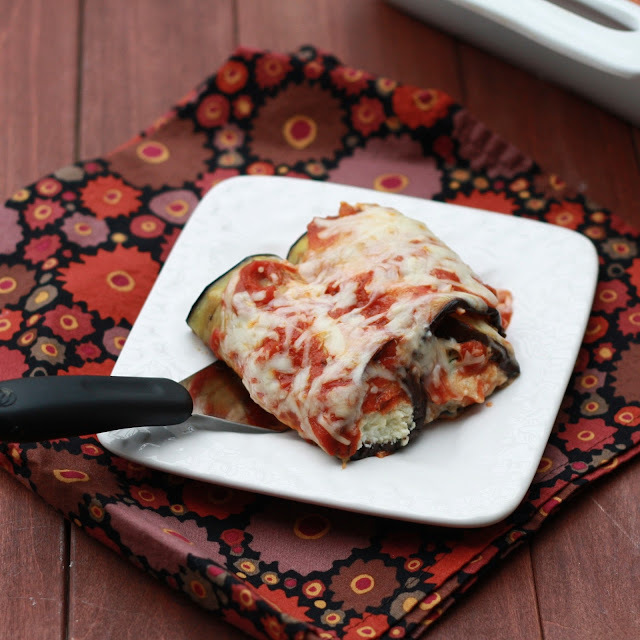 First up: eggplant rollatini, which kind of reminded me of one of our favorites: zucchini parmesan casserole. Okay I guess the only similarities between the two are the use of tomato sauce and mozzarella…and the fact that I loved them both! The recipe requires a few different steps and Real Simple recommended not refrigerating for more than four hours to avoid any separation of the ricotta mixture (I’m pretty sure it could sit a little longer though). I did the prep work on a Sunday afternoon and then baked it when we were ready for dinner. This was another one of those meals where we were pumped for the leftovers. If you have a favorite eggplant recipe, I want to hear it! 1. Heat oven to 450F. Line two baking sheets with foil. Place eggplant slices on sheets and drizzle with olive oil (on both sides). Season with salt and pepper. 2. 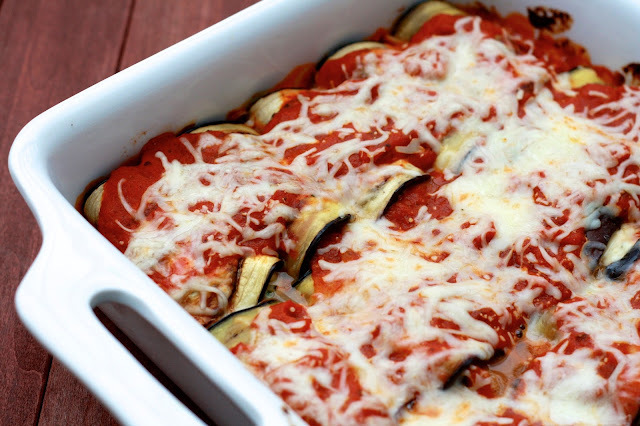 Bake the eggplant, rotating the sheets halfway through, until soft and beginning to brown (12-15 minutes). Allow to cool. Reduce oven temperature to 400F. 3. Meanwhile, in the bottom of a 9-inch baking dish, spread 1/2 cup of the marinara sauce. In a large bowl, whisk together the eggs, ricotta, oregano, 1 cup of the mozzarella, and 1/4 tsp each of salt and pepper. 4. Place about 3 tbsp of the ricotta mixture on one end of a slice of eggplant, roll it up, and transfer it to the prepared baking dish. Repeat with remaining eggplant slices and ricotta mixture. 5. 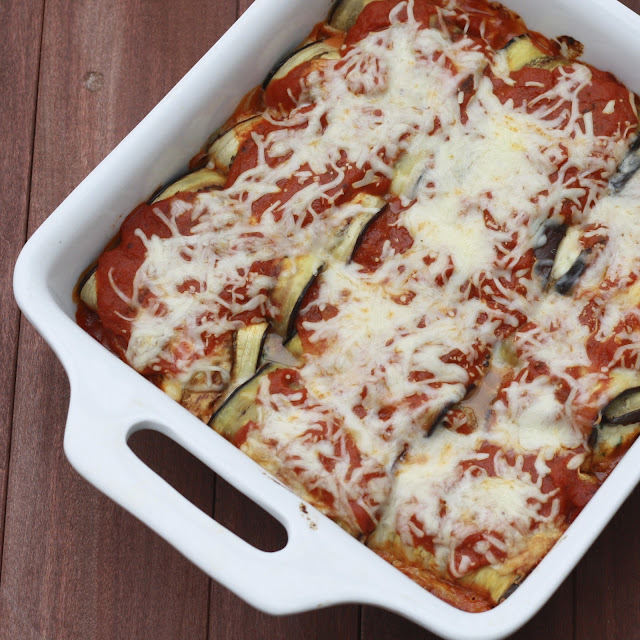 Pour the remaining sauce over the eggplant rolls and sprinkle with remaining mozzarella and Parmesan. 6. Bake for 20-25 minutes, until the cheese has melted and the sauce is bubbling. Allow to cool for 5 minutes before serving.